The demand for SQL information and training continues to grow with the need for a database behind every website capable of offering web-based information queries. SQL is the de facto standard for database retrieval, and if you need to access, update, or utilize data in a modern database management system, you will need SQL to do it. 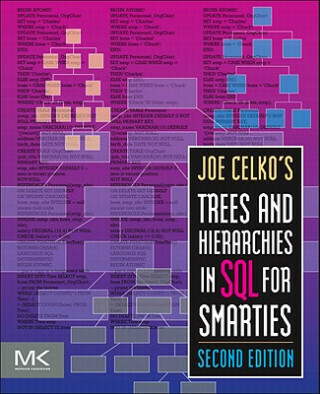 The second edition of "Joe Celko's Trees and Hierarchies in SQL for Smarties" covers two new sets of extensions over three entirely new chapters and expounds upon the changes that have occurred in SQL standards since the previous edition's publication. Benefit from mastering the challenging aspects of these database applications in SQL as taught by Joe Celko, one of the most-read SQL authors in the world. This title offers expert advice from a noted SQL authority and award-winning columnist who has given 10 years of service to the ANSI SQL standards committee. It teaches scores of advanced techniques that can be used with any product, in any SQL environment. It also offers graph theory and programming techniques for working around deficiencies and gives insight into real-world challenges.